Ourpay is Cocosa's exclusive installment payment plan solution. Ourpay allows you to checkout with all the items you love and pay over four easy, interest free installments. Simply browse the site and add your preferred goodies to your cart. Proceed to checkout and pay less today with ourpay! A 12-month delivery subscription combining buy now pay later and discounted delivery. Select from one of the three plans at checkout. When you agree to checkout using ourpay, you only have to pay the initial installment amount (25%) up front. Every two weeks, we will debit a further 25% of the order total until you have completed the full purchase amount. To help you keep on top of you payments, we'll email you through a reminder two days before your next installment is due to come out. 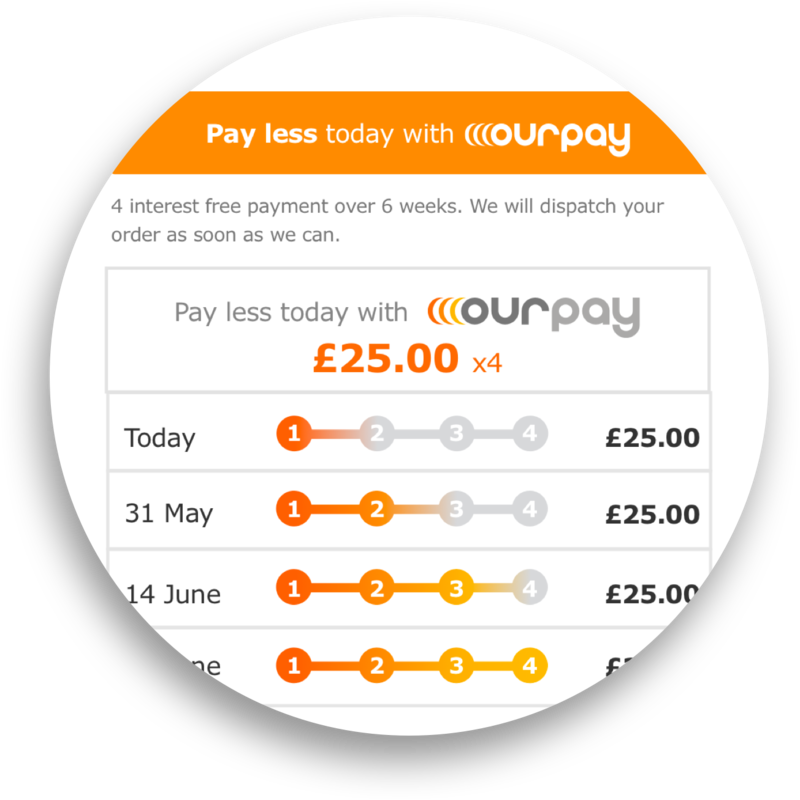 For more information on how ourpay works, please visit our Ourpay Terms and Conditions here. If we are unable to successfully process any of your installments, we will attempt to take the funds from any available payment source nominated on your Cocosa account each day until the installment has been successfully debited. To update or change which card future installments are taken from, please visit My Account, My Payments and add a new card to your wallet. Can I Personalise My Payment Plan? Unfortunately, we are unable to personalise payment plans and must follow the scheduled plan agreed to at the time of purchase. This means we cannot take advanced payments should you choose to settle the payment of your purchase earlier. Is There A Limit To How Much I Can Pay With OurPay? Each customer has a limit ranging from £150 - £250 limit that they can checkout using ourpay. You may not able to see ourpay if you have previously used another payment method. Simply select "Add New Payment Method" and you can select ourpay option. What Card Types Does OurPay Use? How Can I Check When My Next Payment Is Due? You can view your OurPay scheduled payments by visiting the OurPay section of your Account online. If you have used OurPay on any of our sister sites, such as Mysale, you can also see any linked schedules here too.